We really love cheese – hard and soft, aged and young, raw, smoked, goat and sheep, from France, Spain, Italy, or Greece, with berries and truffles or without, and the list goes on. Cheese-making has always fascinated me as an ancient craft. There are so many ways of going about it, and so many possibilities to be considered. To me, cheese is the hardest thing to give up if eliminating dairy from my diet. 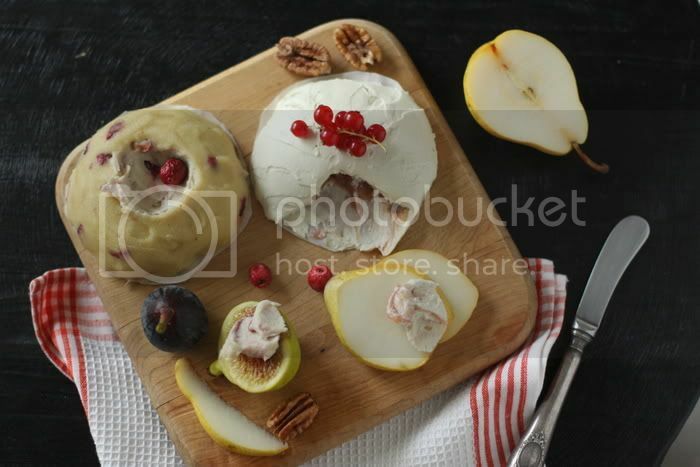 I’ve been curious about making nut cheese for a while, but the thought of fermentation at room temperature scared me away, as things can go wrong easily. For the first try, I decided to make soft cheeses using acidophilus, in a process similar to coconut yogurt-making. This is quite a bit easier than making hard nut cheese, which we would love to post about eventually. I read up on the art of the cheese plate, and many sources suggested offering all three of the most common cheese kinds – cow, goat, sheep. Our variety came from almonds, macadamia, and cashews, the three darlings of the nut world. The (above) almond cheese was inspired by a variety we often enjoyed back in Russia. In the Caucasus mountain region, there is a strong tradition of adding herbs, salt, and pepper to a soft, homemade cheese. I added Cerignola olives for the saltiness, lots of fresh dill, and it tasted like coming home. The cashew cheese was inspired by a heavenly fresh goat cheese that I couldn’t get enough of in Paris. It was filled with figs and had an amazingly light texture. This one is a sort of dessert cheese, and the light fig jam gives it a whole new dimension. And finally, the macadamia cheese with freeze dried cranberries. After letting this one sit for a while, the cranberries become re-hydrated and add nice tart notes to the slightly sweet flavour of macadamia. Our cheese plate included the jewels of late summer – concord grapes and figs. I can’t get enough of both this time of year and will share some more recipes with them soon. 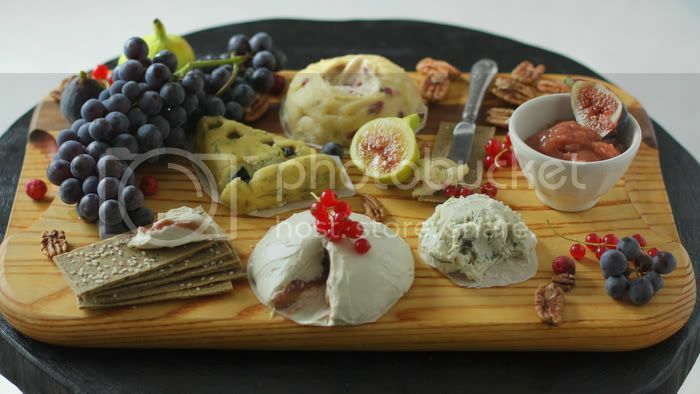 Plain flax crackers, sprouted pecans, olives, cranberries, red currants, and pears completed our cheese plate. I was thrilled that it wasn’t difficult or time consuming at all to make, but most enjoyable to share with friends. Now I need to learn to make hard nut cheese, and if you happen to know good recipes or helpful techniques, please share them in the comments. Thank you so much, and enjoy this beautiful season. Soak cashews and almonds overnight. For a better colour, remove the skins from almonds. In a high-speed blender, combine all of the ingredients separately for each type of nut until very smooth. Leave to sit at room temperature for at least 2 hours. Combine all the ingredients in a high-speed blender, let cool in the refrigerator before using. Alternatively, you can use a dry fig puree. On parchment paper, for easy transfer, mound some of the cashew cheese into a desired shape. Top with fig preserve, and carefully cover with more cheese. Carefully transfer into a container with a lid and refrigerate overnight. In a medium bowl, mix almond cheese, chopped fresh dill and your favourite chopped olives, salt and freshly ground black pepper to taste. Mix gently and transfer the cheese onto parchment paper. Form a desired shape, then refrigerate in a covered container or dehydrate overnight. 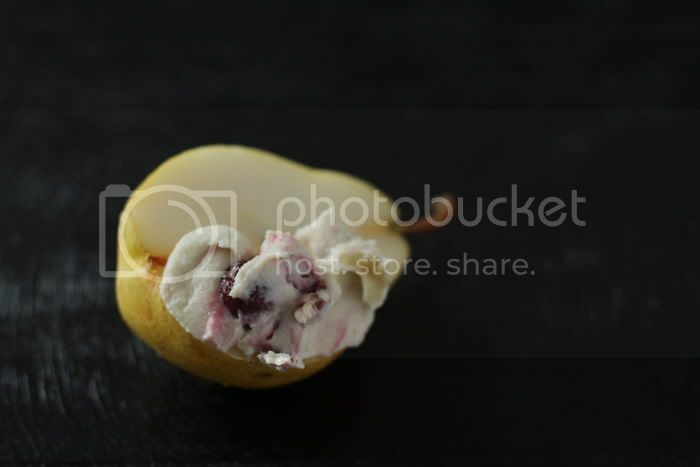 Mix macadamia cheese with dried, or freeze dried cranberries, to taste. Transfer to parchment paper and form into a desired shape. Refrigerate in a covered container or dehydrate overnight. I enjoyed this post. We are trying a new cheese from Whole Foods each Friday (we, meaning my 2 teens and I) So, far we have really taken to “drunken goat”! Your spread looks beautiful. Thank you, Sarah! I’ve tried the drunken goat. There is also a “naked goat” by the same producers and it’s amazing. 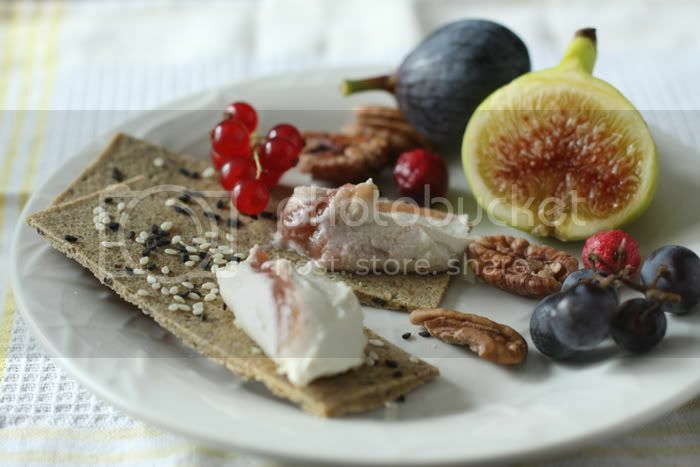 Noel, health food store or online. Such a gorgeous selection of food and perfect looking recipes. I cannot wait to try these soon. Your creations are the most amazing I can think about and it’s always a delight to read your post and watch your pictures. I can’t thank you enough for what you bring me. I hope your blog will go on forever, for your and our pleasure :). wow, I have been following your blog for awhile and you to amazing things with raw food! Everything you make is so beautiful and looks so incredibly good! I love your recipes! I haven’t ventured into the world of making raw cheeses but one day I want to try it. I would love to have you do a guest post on my blog if you are interested. beautiful! I’ve just learnt to make almond cheese (I’m doing the chefs training at Living Light) and yesterday we were drooling over some gorgeous wooden boards in an art gallery. You have so captured the moment of what we were envisaging. Like you I so love a good cheese board and thrilled that I can now make my own dairy free cheese. I also want to move on to aged cheese so will let you know if I have success! Nice I think this will be perfect for tonites Emmy show. I liked the idea to add the fig jelly, will try to make it tomorrow. I tried it (with almonds, and then added dill and olives)! It is delicious. Your blog is beautiful and inspiring. Gorgeous! I have recently found your blog and couldn’t be happier. 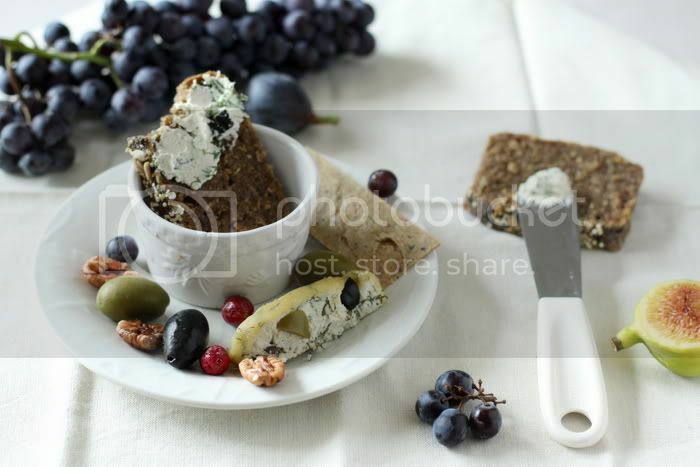 I am hoping to add more raw foods to my diet and was just thinking about nut cheese. I cannot wait to try these! All your recipes looks wonderful. I’ve never tried cheese making. I’ll have to give it a try along with your fig jam. I am a BIG cheese lover. :) Your photos look incredible, I am so pleased I have found your blog. All the best! I am absolutely head-over-heals with your blog. The photography is gorgeous, the recipes are wonderful and simple, the ingredients fascinate me. So glad I found this page. Time to print away a dozen or so recipes of yours! I couldn’t give up goat cheese that I still eat occasionnaly but I use vegan “cheese” on pasta. i am seriously drooling. i’ve been looking for a beautiful cheese plate set up and this is gorgeous. can’t wait to try some of these! Yum this looks amazing. So creative!!! i cant wait to try some. What a fantastic, healthy spin on some delicious treats. One of the best places to eat in New York is doing some very similar, vegan dishes. I appreciate your blog a lot because I am often searching for interesting vegan or gluten free options. THANK YOU! I love cheese, dairy products and looking for alternative raw. If I can’t find acidophilus, will it change the texture and taste considerably? Thanks for this, golubka, I just pinned it. What do you use for the acidophilus? Do you use yogurt starter or take the acidophilus out of supplement capsules? Either way it seems like it would be quite an expensive ingredient. Fantastic post! I’m always looking for vegan cheese. Your cheese board picture reminds me of a real cheese board that I had in Paris years ago. Beautiful pictures. Wow! This is the most amazing website for vegan and raw food I have ever found! Love all of the creations! This looks yum, except for the fact that honey isn’t vegan. Agave syrup, maple syrup or something similar should work just the same.